So what's coming up around here next week? I plan on getting back into the swing of things by participating in Menu Plan Monday again, since you guys seemed to like it! 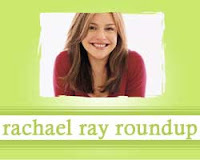 I'm also looking at posting about the October issue of Everyday With Rachael Ray, and sharing some news about Rachael's newest cookbook, Rachael Ray's Book of 10: More Than 300 Recipes to Cook Every Day. Only a few more weeks until it is released! The Food Network, including Rachael Ray, are heading overseas. Kathy of Kathy's Kitchen made Tequila Lime Chicken and Grilled Romaine Hearts with Caesar-cado Dressing. Krista of Krista Kooks is back this week with Meatball and Spinach No-Sagna and Saucy Buttered, Smothered Steaks with Spinach Gratin. Debby at Feast for the Eyes made Fall Pasta with Pumpkin, Sausage and Sage. A recipe from Rachael Ray was among the contenders to tempt a picky 5-year old. Jessica at Johnstone's Vin Blanc made Rachael's Brown Butter Ravioli with Pumpkin. Jen at My Kitchen Addiction created a recipe for Buffalo Chicken Shepherd's Pie that is loosely based on Rach's recipe for Buffalo Chicken Chili. Elizabeth of I Can't Believe It's Not Dead made Pumpkin Whoopie Pies from Every Day with Rachael Ray. Jolene of Jolene Eats Here made Rachael Ray's Cauliflower with Red, Green and Black Confetti. She also made Rachael Ray's Maple-Mustard Pork with Grilled Apples. Holly of Splash of Gourmet made Banana Ice Cream Fakeout. She also made Ancho Chicken Tortilla Soup, Green Gobble Ems Garlic Bread, and Brown Butter Ravioli with Pumpkin. She's almost as bad as I am! Eileen of Eileen Likes to Eat made Rachael Ray’s Tex-Mex Corn Chip Chili recipe. I just stumbled upon your blog, and was hoping maybe you could help me out. I have a set of the Rachael Ray Anodized pans with orange handles, and my 3 qt. saucepan was left on the stove, and the inside melted and bubbled up. Sad I know! My problem is that I can't find that pan anywhere by itself. It is always listed in a set. Do you know the manufacturer of the pans, or know of any way to get just the saucepan? Any help would be greatly appreciated!! I looked around, but only saw the 3qt stainless one available outside the set (that was at www.cooking.com). One pan that is similar that could replace it is her 5-Quart Hard-Anodized Orange Oval Sauté Pan with Helper Handle - I love it and use it more than any other pan. Thanks for the response, I will have to look into getting that pan. It looks nice and isn't too much bigger than the one I am replacing, so hopefully I will use it just as much!